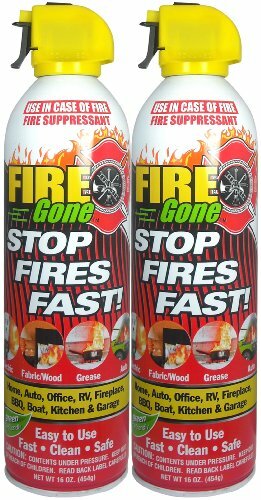 One of the most important items for any shop or garage, and one that gets overlooked far too often, is a good fire extinguisher. Whether you’re an auto mechanic, welder, woodworker or anything in between, the materials you use may pose a fire danger. Having the best fire extinguisher for the job is key. A warning which applies to all fire extinguishers is to store them in a cool, dry location. Exposure to direct sunlight or storage in a potentially hot place like the trunk of a car has the potential to cause excess pressure in the tank and it could explode or lose pressure. For places that regularly reach 100 degrees F or higher, you should be protected with specially designed fire extinguishers. Extended exposure to damp environments may cause the fire retardant to clump and become unusable, but this is very rare. By law, fire extinguishers are labeled with one or more letters to indicate the type of fire they can be used on. “A” is for ordinary things like plastic, wood or paper. “B” is for gas, oil and similar combustibles. For electrical fires, you need a class “C.” There are other types as well, including class “D” for metals, but those are rarely used outside of commercial establishments. The best fire extinguishers are rated for multiple classes, typically A, B and C. Normally we recommend getting one of the models in our reviews. In this one, you should pick up both the top pick and runner up. Read below to see why. 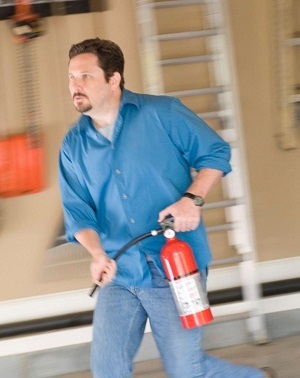 A large fire extinguisher such as this 7 pound model gives you protection for a larger area, or against bigger fires which are likely in a garage or workshop. The Kidde Pro 210 is designed for private and commercial settings of that nature. It is rated for electrical, chemical and ordinary combustibles, so you are protected against anything. Some fire extinguishers are only rated for things like wood or paper, and may even pose a danger when used on chemical fires, but the Kidde Pro, with 4 lbs of dry fire retardant, is useful against almost any fire you may experience. Whether you’re using an oxy-acetylene torch, plasma cutter, or just sharpening a lawnmower blade with your bench top grinder, sparks will fly and accidental fires can start. The Kidde Pro 210 is cheap insurance for preventing a major fire. Keep in mind that your fire extinguisher may leak down over time. The Kidde Pro 210 has been reported to retain a full charge for several years, but it is still a good idea to have it checked periodically. You might also want to take a tip from conventional building code and keep multiple extinguishers around. In commercial settings, a fire extinguisher should be within 100 feet, and accessible from near any exit, even interior doorways. This top rated model comes with a wall hanger to help you mount it securely in a safe location. 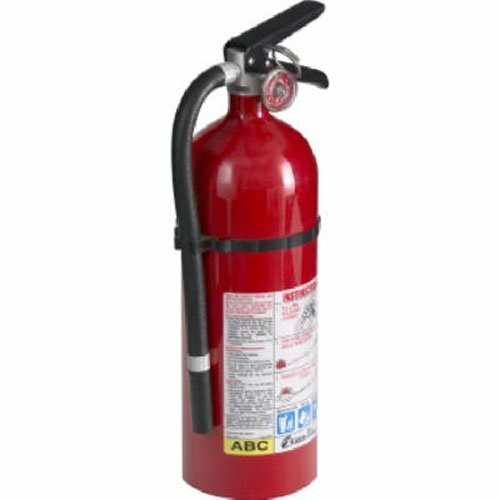 This is the best type of fire extinguisher to use as backup protection rather than your primary extinguisher or in places where a full size model won’t fit. If a fire breaks out, the small can is easy to handle and can be used to get you to safety or to gain access to a larger, more powerful extinguisher. Like the Kidde Pro, it is rated for types A, B, and C, but this one contains only 1 pound of fire retardant. Fire Gone comes in a package of two, so you can place them in multiple locations, including under a counter or near a workspace. There are a couple of drawbacks to the Fire Gone fire extinguishers. The first is that a single pound of retardant is suited for small fires but may not work against larger ignitions. The second major complaint is that the dispenser on the extinguisher is made of plastic and could crack or break if handled incorrectly. As long as you don’t knock it against a hard surface with force, it will not be a problem, but any fire extinguisher should always be handled with care. Rather than mounting brackets for conspicuous placement, Fire Gone canisters are designed to go anywhere and can be stored on a shelf. You can even keep one in your toolbox so long as you are careful to protect it against damages. Fires can be a devastating setback for any business or family. You make a great point about how it’s a really good idea to make sure that you have a fire extinguisher in your garage or workshop. It’s not uncommon for flammable materials to be stored in these environments. If a fire is caught early enough, a fire extinguisher can prevent a major disaster. Thanks for the article.